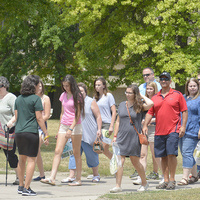 To get the full Open House experience, prospective students and families should plan to arrive to campus at 10 a.m. and stay until 3 p.m, but presentations and tours run throughout the day. The last admissions presentation is at 2 p.m. with the last tour leaving at 3 p.m. Check out the program online to plan the day. Visitors should go to the check-in table to learn where they want to go next. This event includes: campus walking tours; bus tours; facility tours of various buildings and departments; an information fair with college offices and faculty across majors; presentations on admissions, financial aid, housing and more! Advance online registration requested.